Stunning plants for the plant lover in everyone. Propagation Station 4 Glass Tubes | Glass Vases - Wood Hanging Planter with surprise cuttings included! - Handmade! Great gift idea! 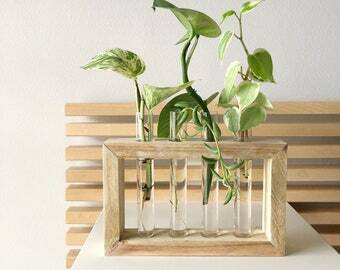 Propagation Station 3 Glass Tubes | Glass Vases - Wood Hanging Planter with surprise cuttings included! - Handmade! Great gift idea! ❄️ Please remember to purchase a heat pack if temps where you live are dropping below 45 degrees at any time. 1 heat pack puts up the temperature 20 degrees. Every extra heat pack puts the temp up 10 degrees more. If temps are dropping under 25 degrees in your area, I won't ship plants until temps rise to over 25. 🍊 Local Pickup available for those who live in Central Florida! Use 'localpickup' in the discount code box to remove shipping costs and then pick up in my Plant Studio (open by appt) or at the Winter Garden or Orlando Farmers Markets. ❤️ Make sure to favorite my shop to stay updated on new listings through your Etsy notifications! Dischidia platyphylla mounted with sphagnum moss on raw wood - Rare! Dischidia ruscifolia Million Hearts - Very Hard to Find! 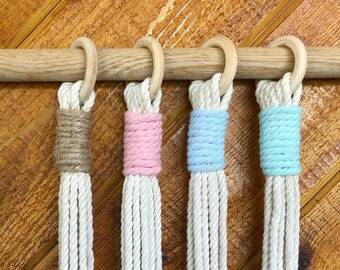 Macrame Plant Hanger - fits 6 inch to 10 inch size pots! Mug & face planter creator!